A dental bridge is exactly what its name suggests, a bridge that fills the gap (which is created by missing teeth) between two sets of teeth. The bridge is fitted onto the anchoring teeth on either side of the gap which are called abutment teeth, with false tooth called pontics in between. The pontics can be made from a variety of metals and materials available like porcelain, alloys or gold, or a combination of these materials. Dental bridges always need support in the form of natural teeth or implants. 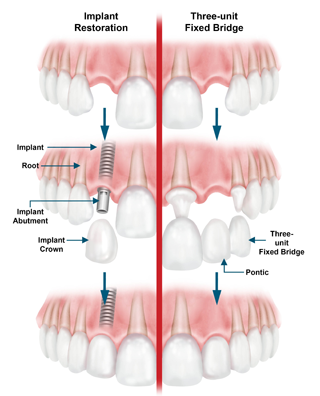 A dental implant is an artificial root implanted into the jaw to anchor the crown. The implant is a titanium post that is screwed into the jaw. Once the implant is screwed in, the surrounding tissue envelops the post and fixes the implant into the jawbone, a process called Osseo integration, creating more stable and secure anchor. Dental implants require surgery and run the risk of complications, like infections, damage to the surrounding blood vessels or teeth, or nerve damage. When a gap is created between teeth because of a missing tooth or many teeth, the smile doesn’t look as charming as it should. The bridges restores the charm of the smile. Chewing becomes laborious because of missing teeth. Bridge restores the ability to chew properly which helps in proper digestion and hence good health. Speaking depends on proper management of air in the mouth. Speech gets affected because of the air escaping from between the gaps created by missing teeth. Bridges corrects speech resulting from escaped air. When teeth are missing, there is an indentation in the cheeks. Bridges restores the shape of the face. The force of the bite is properly distributed when bridges fills the gap of missing teeth. When a gap is created in the jaw, the remaining teeth tend to shift towards the gap. The bridge stops this movement of teeth. The uses of the implants are same as that of dental bridges. The time spent in making and fixing the bridge is considerably less than what is required for an implant. The dentist fixes a temporary bridge till the final bridge is ready. It may take about a few weeks for the bridges to be ready and fixed onto the abutment crowns. Implants take many months before they are properly integrated into the jawbone. Since it involves surgery, the risks to health are more than dental bridges. The cost of implants is many times more than the bridges. In both kind of dental work health is more important than age. When going for dental implants, it is important to be in good health as it requires surgery and usual risks associated with surgery. Also dental implants need a long period for surrounding tissues to grow around implant post to fully integrate it. Dental bridges also require good health but the work is mainly done on the natural teeth and does not require long recovery period. When a bridge goes bad for whatever reasons, the supporting teeth goes with it. If anything goes wrong with implant it is that particular tooth that will have to go, adjacent teeth will not be affected. There are many kinds of dental treatments available today. Dental bridges are as popular today as they were in the last decade, but many more people are now opting for implants, although the cost is quite high, and may not be covered by your dental insurance. Whenever you have to go for dental treatment it is best to give equal thought to each possibility and the cost of each option, your physical health, the oral hygiene habits you have developed over the years and of course whether your insurance cover for your dental care.